Draft: 2011, Washington Nationals, CAth rd. Full name is Brian Christopher Goodwin…resides in Raleigh, N.C. during the offseason...Participated in 2019 Royals FanFest...Spent the 2011 season at Miami-Dade College, where he hit .382/.492/.631 (60-for-157) with 21 extra-base hits and 16 steals in 47 games...Played one season at the University of North Carolina (2010), batting .291/.411/.511 (66-for-227) with 28 extrabase hits and 63 RBI in 60 games…earned Louisville Slugger Freshman All-America honors...Named 2009 Gatorade Player of the Year in North Carolina, batting .473 during his senior year at Rocky Mount High School, leading them to their first state championship in 28 seasons. 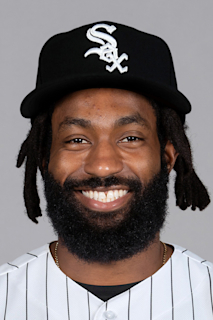 Opened the year with Washington, but was acquired by the Royals on July 22 for RHP Jacob-Condra Bogan…in 75 games between his two Major League stops, he batted .239/.318/.390 (38-for-159) with six doubles, six homers and 25 RBI in a career-high 75 games...Had two stints on the disabled list, missing 38 games with the Nationals (April 17-May 30) with a left wrist contusion and 29 games with the Royals (July 31-Aug. 30) with a left groin strain...Made 34 starts overall: 27 in center field, five in left and two in right…of his 25 starts with Kansas City, 24 came in center field...Hit a pair of grand slams - the first two of his career - which tied 25 other players for second-most in the Majors in 2018, one behind Boston's Xander Bogaerts… first slam came on March 31 (with Washington) off Cincinnati's Kevin Quackenbush at Great American Ballpark…also hit a slam at Kauffman Stadium on Sept. 28 off Cleveland's Adam Plutko...Hit .313/.353/.458 (15-for-48) with five extra-base hits and seven RBI in 13 games at Kauffman Stadium... Batted .341/.404/.659 (14-for-41) with runners in scoring position, including .400/.429/.850 (8-for-20) with Kansas City... Collected a pair of hits in his Royals debut on July 23 vs. Detroit, including a pinch single off Daniel Stumpf… batted .471 (8-for-17) in his first five games with Kansas City, which included a three-run homer at Yankee Stadium on July 28 in the first game of a day-night doubleheader...Recorded a season-high three hits in his second game back from the disabled list on Sept. 1 vs. Baltimore. Began the season with Triple-A Syracuse before being summoned on May 8 and May 24...Recorded a .511 SLG and 33 extra base hits in 64 games after his second recall...When Michael A. Taylor was injured in early July, Goodwin took the reins in center field, starting 28 games in center until Taylor returned...Goodwin posted a .465 SLG (12 2B, 6 HR, 10 RBI, 5 SB, 23 R) during this stretch...Was placed on the disabled list on Aug. 16 (left groin strain)... When placed on DL, he ranked among NL rookies in doubles (T2nd, 21), extra base hits (4th, 35), HR (6th, 13) and among NL rookies with at least 250 AB, was third w/.498 SLG...In 16 games prior to his injury, was hitting .292 with a .585 SLG (7 2B, 4 HR)...Clubbed the game winning HR in Washington's 3-2 win over Miami on Aug. 10...Recorded his first career multi-homer game on June 23 vs. CIN...On July 27 vs. Milwaukee, he joined Wilmer Difo, Ryan Zimmerman and Bryce Harper in clubbing back-to-back-to-back-to- back home runs -- tying a Major League record for consecutive home runs (joining seven other clubs) and marking the first time in franchise history a Nationals or Expos team had accomplished that feat...With his 13 home runs, he was one of 10 Nationals to hit at least 10 home runs, tied for the most of any club in the National League and the second-most of any club in the Major Leagues (Houston, 11)...The Nationals' 10 players with 10 or more home runs are the most in franchise history (Nationals/Expos). Spent the majority of the season with Triple-A Syracuse before getting summoned to the big leagues on Aug. 6 (0-for-1, def. replacement)...Enjoyed two stints with the Nationals...Made his MLB debut, Aug. 6 vs. San Francisco... Was recalled on Sept. 2 and spent the rest of the season in D.C...Recorded his first MLB hit (8th inning single) in first MLB start, Aug.10 vs. CLE...Hit safely in five of his last eight games of the season (5-for-17, 2B, 3B, 3 RBI, BB, R)... Appeared in right field (8 G), left field (5 G) and center field (1 G)...Hit .278 with 25 doubles, one triple, 13 home runs, 67 RBI, 46 walks, 15 stolen bases and 50 runs in 118 games for Triple-A Syracuse...Ranked among International League hitters in RBI (5th)...Ranked tied for second in Washington's Minor League system with 14 home runs...Was named an International League mid-season All-Star...Following the season, hit .313 with six doubles, two triples, two homers, 11 RBI, one stolen base and 19 runs scored in 25 games for Naranjeros de Hermosillo of the Mexican Winter League. Clubbed a career-high 46 RBI in 114 games for Double-A Harrisburg...Returned from a left shoulder injury that plagued him during the 2014 season...Excelled in the Venezuelan Winter League following the season...Hit .316 (42-for-133) with eight doubles, one triple, three home runs, 18 RBI, 19 walks, five stolen bases and 21 runs scored in 35 games for Bravos de Margarita. At the age of 22, in first full Double-A campaign, Eastern League All-Star hit .252 with team-high 40 extra-base hits and a .355 OBP in 122 games with Harrisburg...led the Eastern League with 11 triples, while also ranking among Eastern League leaders in runs (3rd, 82) and walks (7th, 66)...following the season, played in 19 games for Mesa of the prestigious Arizona Fall League and hit .296 with 7 extra-base hits (4 doubles, triple, 2 homers) and 12 RBI...recorded 7 multi-hit efforts in the AFL. Played in 100 games in professional debut with Harrisburg and Hagerstown...combined to hit .280 with a career-best 14 home runs en route to a stellar .384 OBP and .852 OPS for the 2 clubs...was rated by Baseball America as the Eastern League's No. 7 prospect following the season...missed 5 weeks with a hamstring strain in the left leg...hit .238 with 6 doubles, 2 triples, 3 home runs and 6 RBI in 20 Arizona Fall League contests with Salt River...was named the MVP in the Arizona Fall League Rising Stars Game after hitting a first-inning leadoff home run and later legging out an RBI double. March 27, 2019 Los Angeles Angels claimed CF Brian Goodwin off waivers from Kansas City Royals. August 30, 2018 Kansas City Royals activated CF Brian Goodwin from the 10-day injured list. August 16, 2018 Kansas City Royals sent CF Brian Goodwin on a rehab assignment to Omaha Storm Chasers. July 31, 2018 Kansas City Royals placed CF Brian Goodwin on the 10-day disabled list retroactive to July 29, 2018. Left groin strain. July 23, 2018 Kansas City Royals activated CF Brian Goodwin. July 22, 2018 Washington Nationals traded LF Brian Goodwin to Kansas City Royals for RHP Jacob Condra-Bogan. June 1, 2018 Washington Nationals activated LF Brian Goodwin from the 10-day disabled list. May 26, 2018 Washington Nationals sent CF Brian Goodwin on a rehab assignment to Harrisburg Senators. May 15, 2018 LF Brian Goodwin assigned to Washington Nationals. April 17, 2018 Washington Nationals placed LF Brian Goodwin on the 10-day disabled list retroactive to April 16, 2018. Left wrist contusion. October 2, 2017 Washington Nationals activated CF Brian Goodwin from the 10-day disabled list. August 16, 2017 Washington Nationals placed CF Brian Goodwin on the 10-day disabled list retroactive to August 14, 2017. Left groin strain. May 24, 2017 Washington Nationals recalled LF Brian Goodwin from Syracuse Chiefs. May 23, 2017 Washington Nationals optioned RF Brian Goodwin to Syracuse Chiefs. May 8, 2017 Washington Nationals recalled Brian Goodwin from Syracuse Chiefs. March 25, 2017 Washington Nationals optioned RF Brian Goodwin to Syracuse Chiefs. November 29, 2016 CF Brian Goodwin assigned to Naranjeros de Hermosillo. October 14, 2016 Brian Goodwin roster status changed by Washington Nationals. October 7, 2016 Washington Nationals reassigned CF Brian Goodwin to the minor leagues. September 2, 2016 Washington Nationals recalled CF Brian Goodwin from Syracuse Chiefs. August 18, 2016 Washington Nationals optioned CF Brian Goodwin to Syracuse Chiefs. August 6, 2016 Washington Nationals recalled Brian Goodwin from Syracuse Chiefs. March 14, 2016 Washington Nationals optioned CF Brian Goodwin to Syracuse Chiefs. October 22, 2015 CF Brian Goodwin assigned to Bravos de Margarita. October 5, 2015 Washington Nationals recalled Brian Goodwin from Harrisburg Senators. April 24, 2015 CF Brian Goodwin assigned to Harrisburg Senators from GCL Nationals. April 7, 2015 CF Brian Goodwin assigned to GCL Nationals from Syracuse Chiefs. March 16, 2015 Washington Nationals optioned CF Brian Goodwin to Syracuse Chiefs. November 20, 2014 Washington Nationals selected the contract of Brian Goodwin from Syracuse Chiefs. September 6, 2014 Syracuse Chiefs activated CF Brian Goodwin from the 7-day disabled list. July 3, 2014 Syracuse Chiefs placed CF Brian Goodwin on the 7-day disabled list. March 31, 2014 CF Brian Goodwin assigned to Syracuse Chiefs from Harrisburg Senators. January 24, 2014 Washington Nationals invited non-roster CF Brian Goodwin to spring training. August 16, 2013 Harrisburg Senators activated CF Brian Goodwin from the 7-day disabled list. August 2, 2013 Harrisburg Senators placed CF Brian Goodwin on the 7-day disabled list. July 20, 2012 CF Brian Goodwin assigned to Harrisburg Senators from Hagerstown Suns. May 18, 2012 Brian Goodwin roster status changed by Hagerstown Suns. April 10, 2012 Hagerstown Suns placed OF Brian Goodwin on the 7-day disabled list. April 4, 2012 OF Brian Goodwin assigned to Hagerstown Suns. August 15, 2011 Washington Nationals signed OF Brian Goodwin.